Plug into the Hosa JamHub Section Cable - without the messiness and confusion of using three separate cables. The JamHub Section Cable has 2 TRS (male to female) and 1 XLR (male to female) in one cable, for a neat, plug-n-play solution. Each channel is optimized for JamHub connectivity. 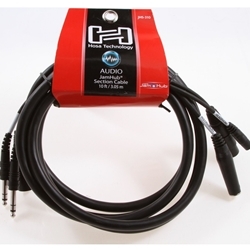 Keep your studio neat and clean (sounding) with the Hosa JamHub Section Cable.